The world of energy can be complicated. Kilowatts, megawatts, and gigawatts; substations and transformers; net metering and fixed charges; nuclear, gas and coal power plants. It’s easy to get overwhelmed, confused, and lost. Sometimes it takes actually standing next to the thing you are talking about to get it. 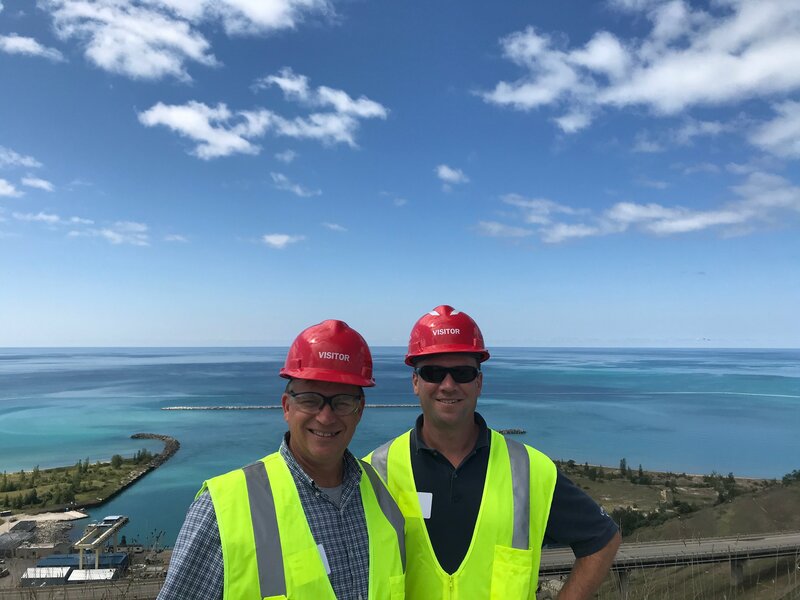 Which is why Groundwork Executive Director Hans Voss and I carpooled down to Ludington last week to see the Ludington Pumped Storage Power Plant. Despite being originally completed in 1973, the technology and plant are state-of-the-art, and top 5 in the world for energy storage, yet the idea is brilliantly simple. The pumped storage facility is basically six large straws. And by large I mean LARGE! 28 feet in diameter, 1,100 feet long, the pipes transfer water between Lake Michigan and a reservoir 363 feet above, on top of the Ludington dunes, which rise at the shore. Owned 51/49 by Consumers and DTE respectively, the computers and 40 Consumers Energy operators who run the plant pump water up into the reservoir when electricity is cheap and release it back to Lake Michigan when electricity is expensive and in high demand. So, when Michiganders are using less electricity around the state—generally at night—the pumps bring the water into the reservoir. When our homes, businesses, and townships need electricity, the plant begins releasing that 27 billion gallons of water to drive six enormous turbines surrounded by magnets that create the electricity we need. The power-generating capacity of the plant is enormous! The over 2,000 megawatts nameplate means that the pump storage plant provides about as much power as a large scale coal or nuclear plant. And it can ramp up or down in about 10 minutes. 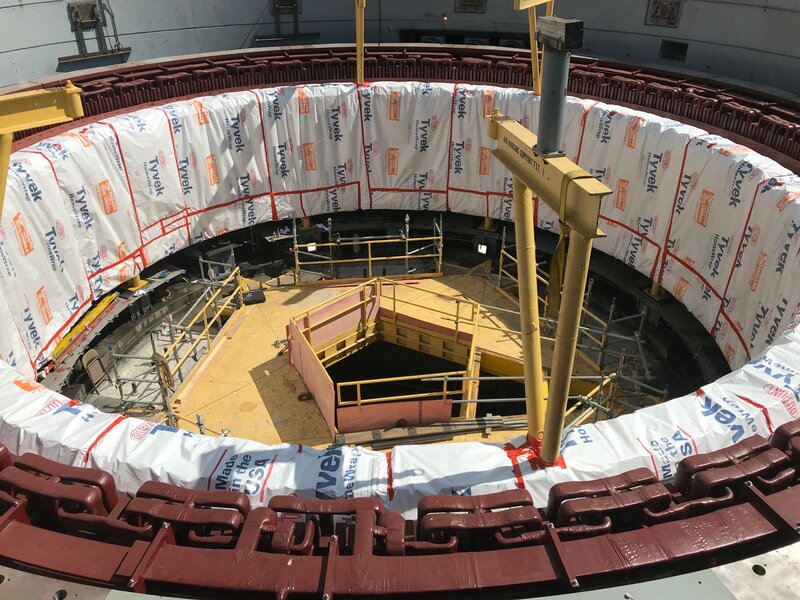 Looking into the hole where the turbine will go—with magnets around the outside to generate current. In case the pump itself doesn’t sound clean enough for the most die hard clean energy advocates, there is a field of wind turbines just across M-22 from the storage pump, whose electrons can help that water get back to the reservoir. As far as overall environmental impact when compared to other energy technologies, Ludington Pumped Storage is a pretty good one. The project does have some land use impact. The land where the facility is located is mostly off limits—although there is a model airplane and drone flying field just outside the fences that is open to the public. The story of how the gorgeous Arcadia Bluffs dune area nearly became inundated with water to become pump storage plant #2 explores some deep land use conflicts. In addition, the pumps pull in and kill fish and other aquatic life—but the kill rates have been mitigated by a mile-long fish net and a crew of divers onsite. So, no, the plant is not impact free, but it does rate relatively low when compared to coal plants or gas plants with their associated emissions, mining and fracking, nuke plants’ nuclear waste issues, and even siting issues related to solar arrays and wind turbines. As we at Groundwork, our northwest Michigan community, and the state start to look closely at power storage options—technologies like Tesla power walls, Michigan-made LG batteries, and large scale utility and commercial backup—the Ludington Pumped Storage Power Plant can teach us valuable lessons about building projects that are local, state-of-the-art, and simple—tapping into local resources, talent, and wisdom to build the clean energy solutions that will power our state over the coming century and beyond. Want to know more about other innovative storage ideas? Check out the links in the sidebar at right, and drop us a line if you know of others that could provide storage solutions in Michigan and beyond! View from top of the Ludington Pumped Storage Plant reservoir, overlooking Lake Michigan. Groundwork Executive Director Hans Voss (left) and Dan Worth. Check out these innovative and brilliantly simple battery storage technologies appearing on the horizon. Fun stuff. Concrete Gravity Trains: Haul heavy weight up a hill when electricity demand is low and let the weight go back downhill when energy demand is high. Ice Energy: Use air conditioning units to create banks of ice when energy demand is low and then use the ice as air conditioning when electrical demand is high. Gravitricity: Use deep, straight shafts—like abandoned mine shafts—to install heavy weights that are raised during low energy demand and lowered during high energy demand.